If you make a habit of setting aside loose change, you may find an unexpected windfall when counting up all those coins. Most credit unions and bank accounts accept rolled coins and will credit a deposit equal to the same amount. Rolled coins are easier to transport and count because they are already separated. Take advantage of your bursting piggy bank or coin jar by sorting your change. 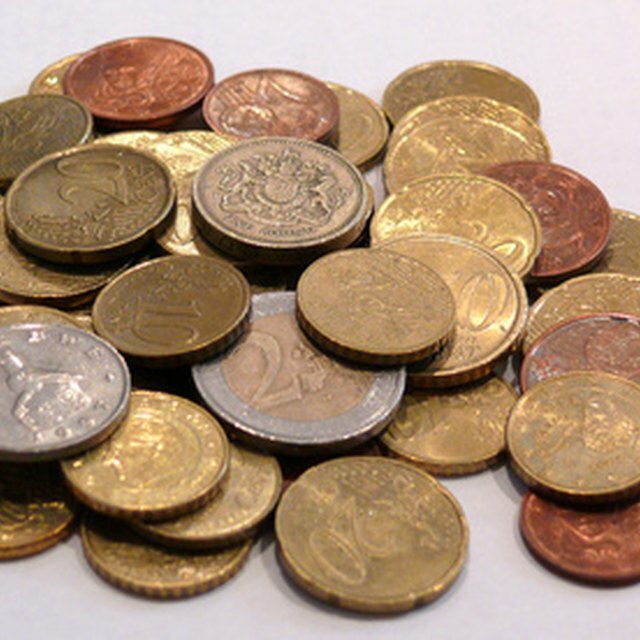 Empty out your change jar and begin separating all coins into individual piles by their value. For example, you'll have pennies in one spot and nickels in another. You'll also have a pile for dimes and one for quarters. If you don't want to put them into piles, you can place them in separate glasses or bowls. Count out each denomination by roll amount. For example, pennies come 50 cents to a roll, nickels are $2 to a roll, dimes are $5 per roll, and quarters have $10 in each roll. Insert each into the appropriate coin sleeve. If you have $20 in quarters, you'll end up with two rolls, while $4 in pennies will net you eight rolls. It is important that you don't seal the roll of coins. Most banks and credit unions require tellers to manually count coins or to run them through a change sorter. Once you have the coins sorted and wrapped, you'll need to complete a deposit slip. In general, checking and savings account deposit slips itemize deposits by check, cash, and coin. Fill out the deposit slip according to its itemization and total the coin deposit amount. Take the coins into your bank or credit union's lobby. Give the rolled coins to the teller to count, along with your deposit slip. Most banks and credit unions will not accept coin deposits via the drive-thru, so you'll need to go inside to complete the transaction. Once the teller confirms the deposit amount, she will print and hand you a receipt for your deposit. Take a minute to confirm that the deposit amount is correct. If the number is incorrect, the teller should be able to show you the discrepancy, such as one of the pennies was actually a Canadian coin and not an American penny. If your bank currently has a coin counting machine, you can save time by skipping the rolls and simply dumping your jar of coins into the machine. The machine will count the coins and give you a ticket with the total coin amount listed on it. Give that ticket to the teller along with a deposit slip. A few banks that still have coin counting machines include Republic Bank, Cape Bank and American Eagle Federal Credit Union. TD Bank: Does TD Bank Accept Wrapped Coins Now? My Bank Tracker: Coin Counting Machines Still Exist: Which Banks Have Them?